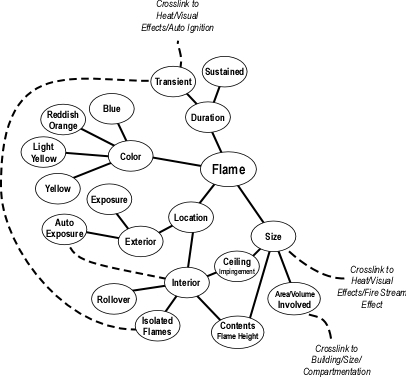 The previous post in this series, Reading the Fire: Flame Indicators briefly looked at flames, the visible, light-emitting product of combustion and identified several basic categories of flame related fire behavior indicators as illustrated in Figure 1. As with each of the B-SAHF (building, smoke, air track, heat, and flame) indicators, it is essential that assessment of flame related indicators is integrated with other elements of the B-SAHF scheme to gain a clearer sense of fire conditions and likely fire behavior. Location of the flames may provide important information. If flames are visible from outside the structure, where are they coming from? It is important to connect this information with building factors such as compartmentation. Is fire showing from a single window due to compartmentation or simply because that is the only window that has failed? Are the flames pushing from inside a compartment or is smoke igniting and burning outside? 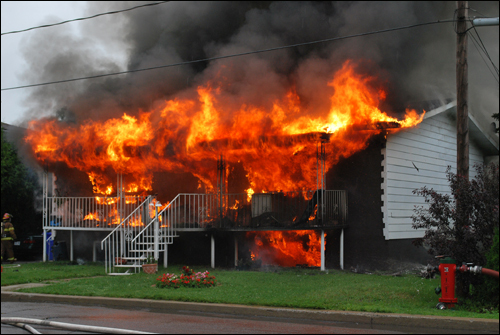 Given the conditions depicted in Figure 2, the size and location of flames make it obvious that the fire involves multiple compartments of this single family dwelling. However, it is important not to be distracted or deceived by conditions observed from one location! Early on the morning of July 21, 2007; Contra Costa County Engine 70 responded to a residential fire with persons reported at 149 Michelle Drive. On arrival, Engine 70 observed fire showing from the door and large picture window on Side A. From this limited view of the building, the fire appeared to be in the living room with potential for trapped occupants in the bedrooms. Engine 70 went to work knocking down the fire from the doorway and initiating a primary search of the bedrooms. However, conditions were not as simple as they seemed. The fire, which had originated in one of the bedrooms on Side B was burning in a ventilation controlled state with a substantial accumulation of gas phase fuel in the bedrooms and hallway. As Engine 70 conducted their search, increased ventilation returned the fire to flaming combustion, igniting the gas phase fuel (smoke) in a flash fire that killed Captain Matthew Burton and Engineer Scott Desmond (for more information on this incident see: Contra Costa LODD, Contra Costa LODD: Part 2, Contra Costa LODD: What Happened?). It is absolutely critical that observation of flames be integrated with all of the B-SAHF indicators from more than one perspective. The first arriving officer should conduct a 360o reconnaissance whenever possible. However, this is not always possible. If the first arriving company cannot accomplish this task, it does not diminish the importance of determining conditions on other sides of the building and another company should be assigned to complete this task as soon as possible. While working inside the building, what is the flame height? Are the flames impinging on the ceiling and bending to travel horizontally? Do you observe flames in the hot gas layer (i.e., ghosting, rollover)? Fire development speeds considerably after flames in the plume of hot gases reach the ceiling and begin to travel horizontally in the ceiling jet. Isolated flames in the hot gas layer are a strong indicator of a ventilation controlled fire. Flames in the hot gas layer or development of rollover are an important indicator of imminent flashover. With flame indicators, it is not just what you see that is important. What you do not see is equally important. Remember that the low oxygen concentration in backdraft conditions may preclude flaming combustion (at least in that compartment). However, conditions can vary widely from compartment to compartment (void spaces are compartments too!) and you may have visible flames from the exterior, but quite different conditions inside the building. As with other fire behavior indicators, change over time is an important indication of fire development or progress towards control. This is particularly true with flaming combustion. Once fire control operations have started, firefighters and fire officers must evaluate the effect of fire streams. Failure of water application to reduce the size of the fire indicates that either the flow rate is inadequate, the application point is ineffective, or both. Flame color is largely dependent on the type of fuel involved and the extent to which the fuel and oxygen are mixed (see the previous post Reading the Fire: Flame Indicators, Figure 2-Diffusion and Premixed Flames). Because there are several influences on flame color, it is important to interpret this information in context with other fire behavior indicators. Organic materials (natural or synthetic) will tend to burn with light yellow to reddish orange color depending on oxygen concentration as illustrated in Figure 3. 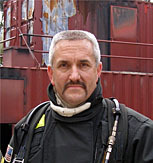 While flame color can often be observed from the exterior as illustrated in Figure 3, it is also important while working inside as observed by Captain James Mendoza of the San Jose Fire Department. The coloration of diffusion flames commonly encountered in structure fires runs from red to orange to yellow to almost white. This scale tells you something about the energy of the fire, with the redder the flame, the less temperature and radiant heat it is releasing. Often the lower energy red flames are due to combustion occurring with limited air, and if ventilation is increased, the energy released increases, temperature increases, and color changes from red to orange to yellow to white. So, if you are feeling extreme heat as you move towards dark orange flames, realize the air you just let in by opening the door can make the conditions worse, and you may be able to see that visually by a lighter flame color. If organic fuel gas or vapor is premixed with air, flame color will be bluish. In compartment fires, a lazy bluish flame moving through the hot gas layer is an indication of a substantially ventilation controlled fire. However, it is important to remember that flame contact with other materials may influence color. For example, flame impinging on copper will have a blue green color. Less commonly encountered in compartment fires, a bright white flame is usually indicative of high temperature such as that generated by burning metal (i.e., magnesium). Given adequate fuel and oxygen, flaming combustion is likely to be continuous. 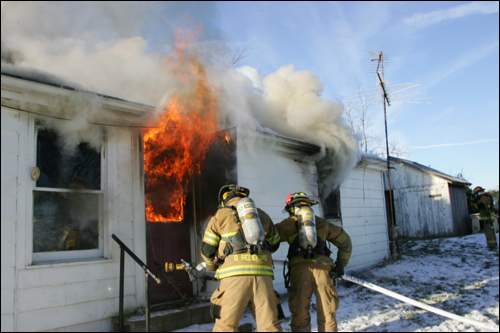 However, when a compartment fire is burning in a ventilation controlled regime, flames may be intermittent as fuel and oxygen concentration varies. Watch the following video and observe the difference in flaming combustion from the window on Side B in the first 45 seconds (0:00 to 0:45) and from the window on Side A the next 30 seconds (00:46 to 1:16). How are the flames different? Why do you think that this is the case? 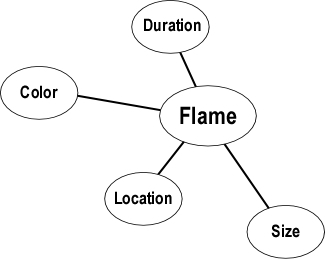 Hopefully we have been working on this project together and you have been developing or refining the flame segment of your fire behavior indicators concept map. My current map is illustrated in Figure 4. You can also download a printer friendly version of the Flame Indicators Concept Map v5.2.2.1 As always, should you have any suggestions or feedback, please post a comment!